This was one for everybody who has ever dreamed big. 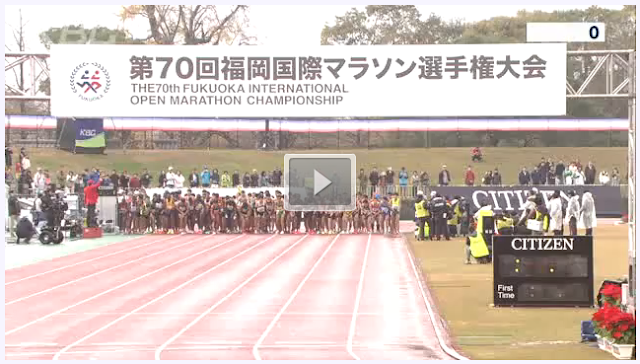 For its 70th running the Fukuoka International Marathon brought together a good 2:07~2:08 field with two-time champ and former world record holder Patrick Makau (Kenya), 2015 World Championships silver medalist Yemane Tsegaye (Ethiopia), debuting sub-60 half marathoner Paul Kuira (Kenya/Team Konica Minolta) and more, but for most viewers it was all about Yuki Kawauchi (Saitama Pref. Gov't). Kawauchi, the most famous Japanese marathoner of his time, having announced that this would be the last time he would run to try to make a Japanese national team, going for the London World Championships after having missed two Olympic teams. An injury to his right calf three weeks ago after training too hard too soon after his runner-up finish at the Nov. 6 Porto Marathon, then a sprained left ankle yesterday in his last tuneup run. Everyone around him telling him not to run. The media saying it would take a miracle for him to make it. 3:00~01/km was the target, and Australian pacer Collis Birmingham opened with exactly that despite a slick track surface and high humidity after morning rain. The three Kenyan pacers, however, weren't up to the challenge. One, Charles Ndirangu, dropped out after 8 km. The other two held back slightly slower than their assigned pace, running behind Birmingham and holding the pack back at a margin that ranged from a few strides to a few seconds. Birmingham was scheduled to drop out at 15 km but stayed in until 17 km to try to keep things moving. The pace became more erratic once he departed, followed quickly by another's departure just after halfway and then the last pacer's premature pullout at 22.5 km. 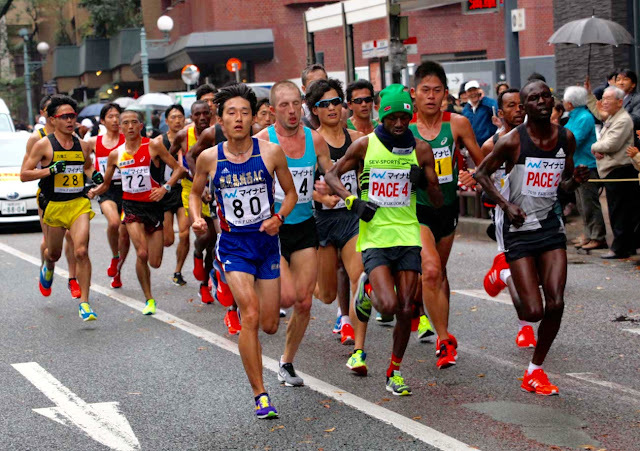 Left in front wearing bib #80 was Yusuke Tobimatsu (Kagoshima Josai AC), an amateur club runner with only a half marathon best of 1:05:26 and an apparent 2:20:38 marathon debut earlier this year behind him. Throughout the first half Tobimatsu ran at the front of the field, looking smooth and controlled as he went through halfway in a large new PB of 1:04:24 before finding himself at the helm. Showing no signs of his injuries, Kawauchi quickly stepped up to assist, moving up next to Tobimatsu and the two of them pulling ahead. 2:04 man James Kwambai (Kenya) couldn't handle the change in pace and dropped out, but other top Africans in the race including Tsegay, Yared Asmerom (Eritrea), Amanuel Mesel (Eritrea), Tariku Bekele (Ethiopia) and Melaku Abera (Ethiopia/Kurosaki Harima) were quick to recognize the danger of letting Kawauchi get away and went after them. And like that, the race got down to business. When the pack reached them Tobimatsu was immediately gone, but Kawauchi reacted with an aggressive surge that put him 2 or 3 seconds ahead. 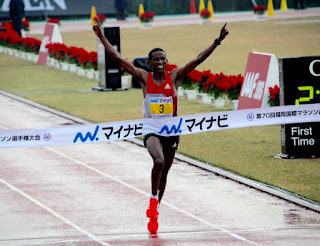 Abera, the winner of February's Beppu-Oita Mainichi Marathon, went after him and then past at 25 km. A few minutes later Mesel, Tsegay and Bekele joined Kawauchi, forming a four-man chase pack as Abera pulled away on the approach to the 31.6 km turnaround. Behind them, Makau and Kuira left the third pack, taking their time in working up to the main chase group. In the remnants of the third pack were three Japanese men, all running outside themselves: Ryo Ishita (SDF Academy) with a 2:13:52 best, 2:17:40 runner Hayato Sonoda (Team Kurosaki Harima) and independent Aritaka Kajiwara with a PB of only 2:18:01. All on 2:08 pace. Makau and Kuira joined Kawauchi's group before the turnaround, just in time for Makau to start pushing in pursuit of Abera. Kawauchi responded with a hard surge that killed off Bekele and Kuira, cutting down the distance to Abera and the competiton to Tsegay, Makau and Mesel. Seeing his chance slipping away before his eyes, Sonoda tore away from the third pack to try to catch up before it was too late. Makau countered Kawauchi's move with a surge that carried him and Tsegay past Abera into the lead. Kawauchi and Mesel took longer to overtake the early leader, but when they did Kawauchi attacked again to move into 3rd free and clear with just over 5 km to go. Tsegay and Makau traded attacks over the final kilometeres as Kawauchi fought to bridge the 15 second gap to them, but when Tsegay's final move came he was still out of range. Tsegay pulled away from Makau after 40 km to win in 2:08:48, Makau just 9 seconds short of him in 2:08:57. With everyone having pressured him to sit Fukuoka out and reset his London attempt to Tokyo or Lake Biwa, Kawauchi gave it everything he had on the uphill and last lap to take 3rd in 2:09:11. With injuries to both legs it was a race of pure determination that showed the absolute best of what he is about. This was his attempt, he had been invited to run, he had committed himself, and he considered it a moral obligation to see it through and live up to his word no matter what the personal cost. Nothing was going to stop him, not even his own body. With his final dream at stake Kawauchi delivered the miracle, tears streaming down his face and speechless. He wasn't the only one. And he wasn't the only one to dream big. Tobimatsu through the first half. Ishita and Kajiwara in the third pack. Sonoda, a minor runner from a minor corporate team, soaring in for a seven-minute PB of 2:10:40 for 4th. Both Kajiwara and Tobimatsu hanging on for four-minute PBs. All outsiders, all playing big. All can hold their heads high. A crafty win by Yemane over Makau. A smart run by Reid Coolsaet (Canada) for 7th in 2:10:55. An honorable goodbye to past Fukuoka champ Dmytro Baranovskyy (Ukraine), 8th in 2:11:39 in his retirement run. But it was all about Kawauchi in the end, regardless of what the JAAF thinks of his performance in regard to London selection. I've been lucky to travel around the world with him and to see many of his best races. This was something else. The pure essence of everything he has meant as a person and as a concept. Transcendence of even the idea of conventional wisdom. Count me among the people who tried to talk him out of doing it. I don't know how he did. But sometimes in life you are lucky enough to witness something that elevates us all as human beings. Now the question is....will he make the London team...?! Kawauchi is such a runner and also looks such a man ! Running his 10th sub 2h10' (11th one 2h10'01) in these conditions looks unbelievable. Thanks a lot for your always very interesting reports. Great run by Kawauchi, of course, and also Sonoda. Brett -- I really appreciate your reporting on these events; your perspectives are go way beyond 'informative.' They are an important part of my appreciation of what these athletes do. Thank you. I just wanted to say your write-up literally had me in tears -- this is such an awesome blog, and you do something amazingly helpful and inspiring for running fans. Kawauchi just texted to say, "I'm very grateful to all my fans around the world." What shoe was he wearing? Custom PE racer? He was probably wearing some kind of Asics Sortie Magics. At least what they look like to me. Yes, there will be a biography at some point. The story's not finished yet, though. I think he was wearing Sortie Magics.